For years the IPC has received calls involving a child getting into laundry detergent. Luckily, an unintentional taste of powder or liquid laundry detergent by a child is expected to cause minimal toxicity: throat or stomach irritation at the worst. In fact, most children don’t develop any symptoms at all. However, over the past couple months we (and the other poison centers in the country) have been seeing a new formulation of laundry detergent that is causing alarming toxicity. These are the ‘single use’ pods/packs that contain highly concentrated liquid detergent. Ten minutes after swallowing the contents of a laundry detergent packet, a 20-month-old child developed profuse vomiting, wheezing and gasping and then became unresponsive to even painful stimuli. A 15-month-old who bit into a pack and swallowed a mouthful had profuse vomiting and, after arrival at a hospital, had to be put on a ventilator for airway protection. A 17-month-old bit into a packet and then rapidly developed drowsiness, vomited, breathed the product into the lungs, and had to be put on a ventilator. Laundry detergents, even concentrated ones, would not be expected to cause drowsiness, let alone the level of unresponsiveness seen in these cases. Investigation into which ingredient in these formulations is the culprit is ongoing. Meanwhile, if you have this type of product in your home, the IPC along with the American Association of Poison Control Centers is strongly advising parents to be extremely vigilant about keeping these products locked up, out of reach and out of sight of children. 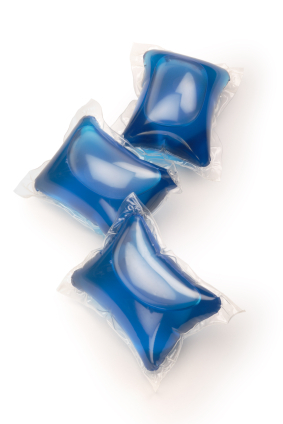 If you think anyone may have been exposed to any laundry detergent, please call the IPC immediately at 1-800-222-1222. Thanks for the great information about laundry detergent pods – a product that many of us use for it’s convenience. I never looked at it as a poisoning waiting to happen. Your information has been shared with the public on our hospital’s facebook page and I will also plan to share it with my family, friends and co-workers! Thank you for being proactive on this matter! Thank you for reading! We’re happy you found the information useful! Be sure to check back every Tuesday for more great tips and info.